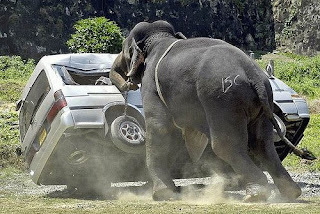 Sarah Palin is the rogue elephant in the GOP war room. If her negatives keep climbing we are likely to see more anger and more blame being thrown around the McCain HQ. I expect to see them at fewer and fewer joint appearances in the next few days. Palin is done with Johnny Crash and now that her mentor Ted Toobz Stevens is guilty as charged she is going to be scrambling to maintain her political position even in her home state. Trooper-gate, 20,000 dollar make-up sessions, and Louis Vuitton bags are certainly not going to help her Alaska Hockey Mom image back home. Sarah is clearly getting pissed and pissy.